This morning – I run Tough Mudder Toronto blindfolded. Three favorite / notable / awesome races to date? Tight spaces (that one is always an issue), especially those filled with water. Something about not being able to see them, makes them that much more anxiety-provoking. Jumping off Walk the Plank. Electric Eel – crawling across the slippery surface, filled with electric wires. Having a blindfold on for that long – a mindfuck of its own. Not being able to run at full speed. Having to rely on others. My next goal is go back and complete what I failed at Goruck Selection. How do you know SOLO? I anticipate indecisive wording as a problem as Solo tries to complete each obstacle, we have to describe everything around her so she can develop a picture in her mind of what’s to come, and trying to not bump her head off too many objects, ha! Having just discovered OCR in the late summer of 2013 I’ve only done a handful of races to date. 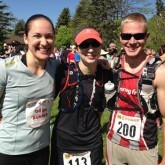 But my three favorites are: Mud Hero, 5 Peaks-Terra Cotta and GoRuck Light. 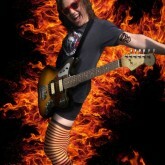 I read Kate’s blog and follow her on Facebook. 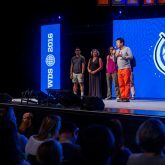 When she posted about doing Tough Mudder blindfolded, I contacted her to share about my Vision and Hearing loss, and my desire to run Tough Mudder as well. Being Legally blind (my visual field is less than 15 degrees) I think the biggest challenge in running Tough Mudder blindfolded is the complete lack of vision. You will have to put your full trust in others to guide you successfully over, under and through physically challenging obstacles. There is a fear of the unknown…There is a feeling of isolation…This is not a feat for the faint-hearted! Fuego y Agua: Nicaragua Survival Run 2014 – By far the toughest challenge I have ever faced. First time I saw Solo was at the 2013 Mudnewton Race where she was wearing a frilly prom dress and carrying a cake the whole race. I was impressed and intimidated all at once. The biggest challenge will be that the guides’ verbal directions need to be descriptive and enough to help, not hinder your movements. I remember the hail bails at “Prison Break” and your poor nose… sorry. Ryan is the gazelle is the team. He is fast. Like… if we forget something at the start line, and we are half way through the course, he can jog back and catch up with us, without bringing his heart rate up too much – fast. Notable / awesome races to date? Spartan Sprint two years ago – my first obstacle race – I’ll never forget it. And Tough Mudder 2013 – met a lot of cool people there. Yoga Tree – she was my yoga teacher. *Papa SOLO is joining us as well for his first ever Tough Mudder! He said that the biggest challenge he anticipates is persuading my mom that he will come home alive. I guess I should not tell her that he’d have to sign a death waiver. Curious why I’m running Tough Mudder blindfolded? Read more here. Operation Light Within is a charity initiative to raise awareness for athletes with disabilities. 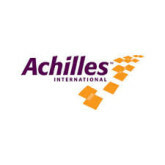 The charity I chose as a beneficiary is Achilles International. They are an organization whose mandate it is to “enable people with all types of disabilities to participate in mainstream athletics”. It’s a fundraiser with a twist. Coz that’s how I roll. Part 1. I will run Tough Mudder Toronto blindfolded. This will be a practice run as I will aim to learn from my guides what kind of verbal instructions are necessary and most helpful. Think this is all kinds of cool and awesome? Me too. 🙂 Please tell your friends, send them this link and spread the word. If you are running Tough Mudder Toronto, and see me on course, holler! If you hear others wondering what the heck is going on, tell them more. 2. Run with us in NJ. Save the date! 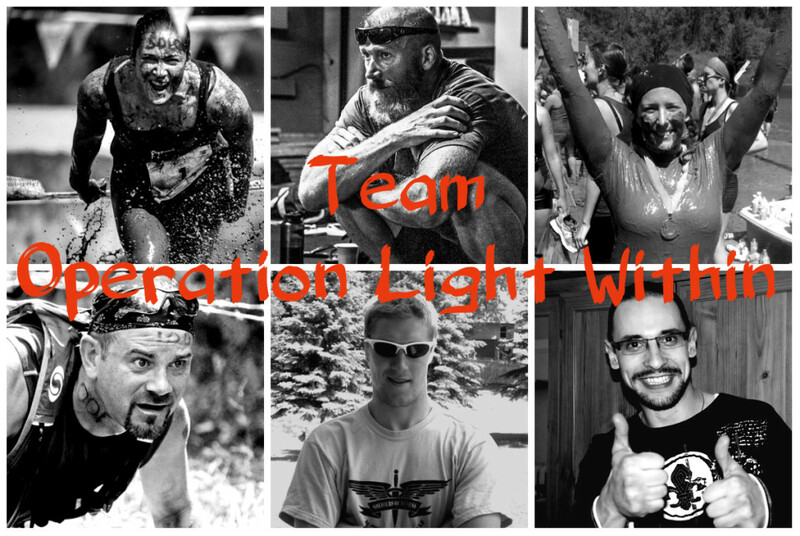 Team Operation Light Within will run Tough Mudder Tri-State (NJ) on Saturday, October 11th. We’d love to have you. GoFundMe campaign for Operation Light Within has been set up, and I would appreciate your help. I would like to make a donation of at least $1,000 to Achilles International, an organization that works with disabled athletes. 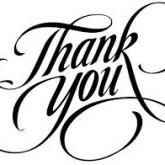 I am currently arranging free registrations for Rhonda and the guides for the October event, however, I am looking for any financial contributions to help with gas, hotel and food expenses for the team. This is something I’d normally cover out of pocket for myself, however, having a number of people involved makes this a bit more costly.